The Cherokee boys had themselves a day in the Challenge Race running fourth as a team scoring 204 behind Lasalle 83, Council Rock North 109, and Carlisle 186. Cherokee was led by senior Justin Kelly in ninth at 15:52, teammate Chris Spisak right behind in 10th at 15:54. The rest of their scoring five would finish 49th, Chase Miller 16:43, 61st, Jonathan Conn 16:50, and 80th, David Jackson 17:07. The South Jersey squad averaged 16:30 between their scorers. When combining the whole meet's worth in performances Cherokee actually moved up to third overall thanks to a great run by Ethan Wechsler who won the junior varsity race with a time of 16:37. He broke into Cherokee's top three on Saturday based on time! 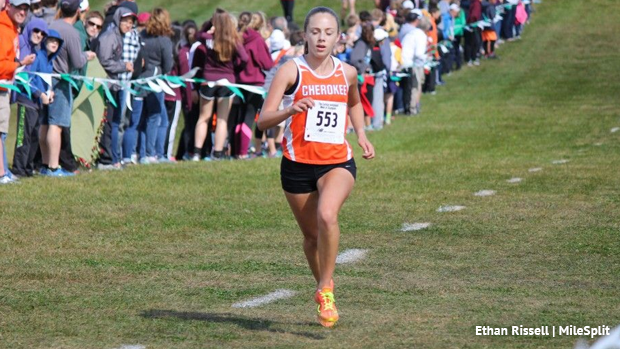 Cherokee's Kate Rathman won the girls championship race, the sophomore crossed the line at 19:06 with over a 20 second lead. As a team they finished fifth in the championship scoring with 229 points and a 20:27 average. When looking at the merge they ranked 21st out of 68 total teams. The rest of their scoring five: Sophia Eick 19:50, Shannon Young 20:19, Riley Gleason 21:22, and Kayla Fericy 21:35. Robbinsville also ran well as they scored second in the boys championship race with 237 points (8+34+58+63+74) behind Oxford Area at 198. Dan White led the Ravens placing eighth at 16:18. In the merge the boys held onto 14th out of 72 teams. The girls placed 10th in the championship race with 374 points and a 21:09 average. Their leading performers Nicole Radosti 39th at 20:28 and Alyssa Sepcic 41st at 20:31.